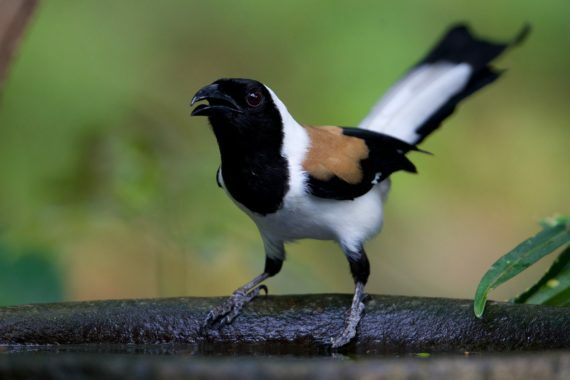 The following is a guest post by Ajay Gadikar, a keen birdwatcher from Indore. He has been observing the Indian Grey Hornbill’s breeding behaviour for the last 6 years and has revealed some interesting habits about them. He made a documentary movie “UDAAN” in 2013 which was screened by the Chief Minister of the state. He has also been honoured twice by the Forest Department for his efforts on bird conservation. I have been observing the Indian Grey Hornbill’s (Ocyceros birostris) breeding cycles for the last 6 years. Their breeding cycle starts from March onwards as this is when they are mostly seen in pairs rather than in flocks. The pair moves together at this time of the year and their courtship feeding ritual is also observed. The male bird approaches and offers figs, often of different types, to lure the female for courtship. 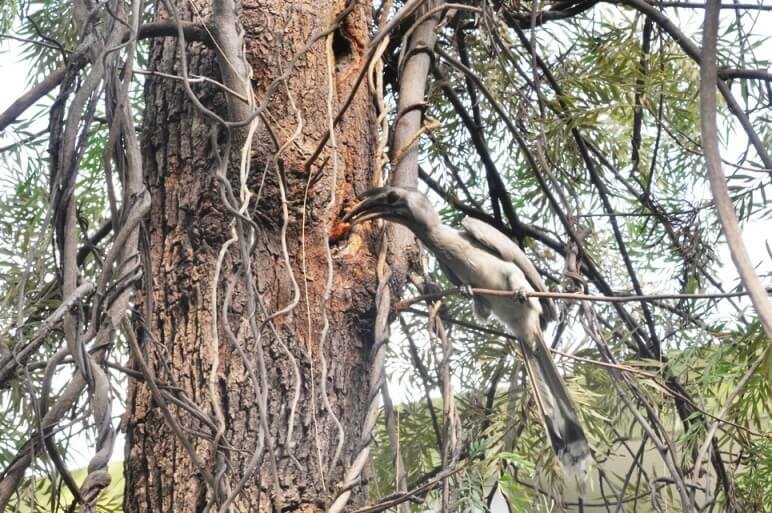 Over the years, I have noted their nesting sites (the same trees are used year after year for making the nest) at several places in the residential areas of Indore. I usually start visiting the areas with the nests in the first week of March to see their courtship behaviour and the status of the nest sites. However, to my surprise, this year I observed that the nests were occupied in the first week of March which was a bit earlier (maybe by 15-20 days looking at my previous years data) at 5 out of 6 nesting sites. My older records show that in the previous years, the nests are occupied only by the end of March or in the first week of April. This change in their nesting behaviour needs to be studied in detail to understand if this earlier nesting indicates something, or if it points to some other factors like climate, fruiting seasons, etc. In the coming days, I intend on trying to focus on the food that the male bird brings for the female at the nest site. This might help in understanding which trees have started fruiting earlier. Sources suggest that the year 2017 will be as warm as or warmer than the previous years and I wonder if the bird has also sensed this and adjusted their nesting cycle accordingly. The Indian Grey Hornbill is a common species of hornbill that is endemic to the Indian subcontinent. 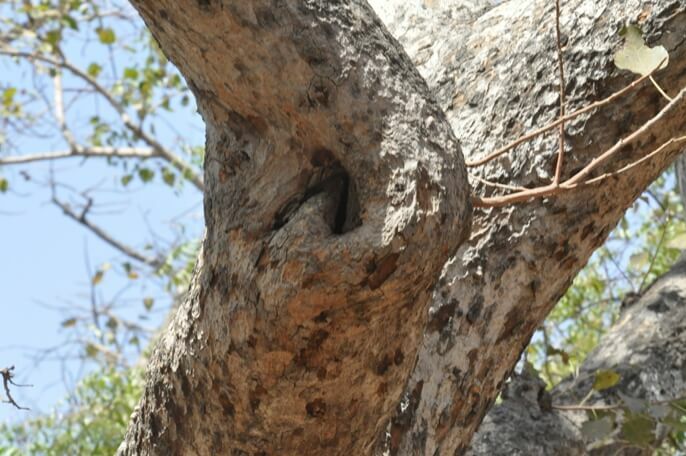 Like other hornbills, they nest inside tree cavities. The female enters the nest and seals the nest hole. Once inside the cavity, she moults and incubates the eggs, raises the chicks and once the young ones are mature enough, breaks the seal open to leave the cavity. During the entire time that the female is sealed inside the cavity, the male feeds her and the juveniles. The timing of breeding of birds is a crucial aspect of their behaviour and ecology, and can affect their population as well. We encourage birdwatchers to look for any evidence of breeding behaviour (including nest-building and feeding young) and report it when uploading lists to eBird (how do I enter breeding codes?). In this way we will be able to collectively generate information about variation in breeding seasonality across different parts of the country as well as see if there are changes from year to year.